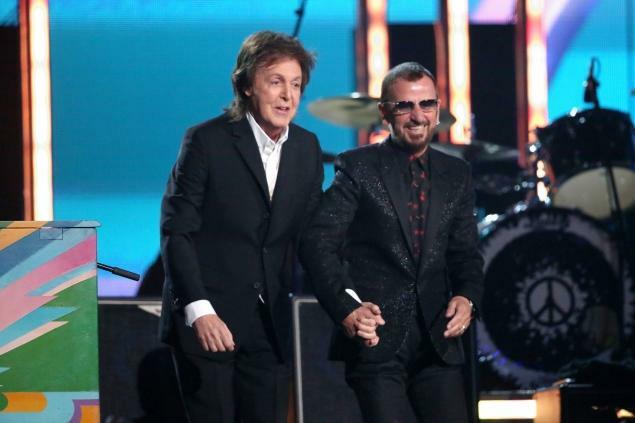 ← Will Paul and Ringo COME TOGETHER Live for the 50th? 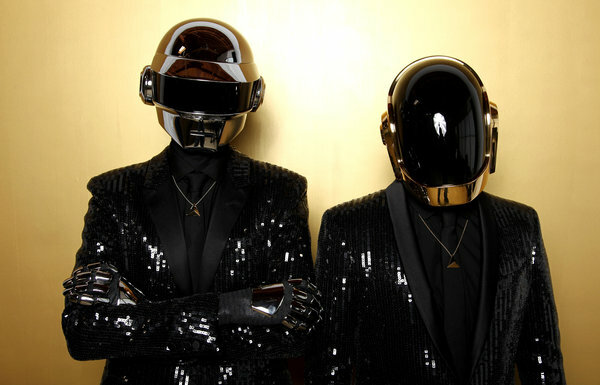 There were some Daft Punks at The Grammys, but the originals stole the show at the 56th Annual Grammy Awards Presentation in Los Angeles. 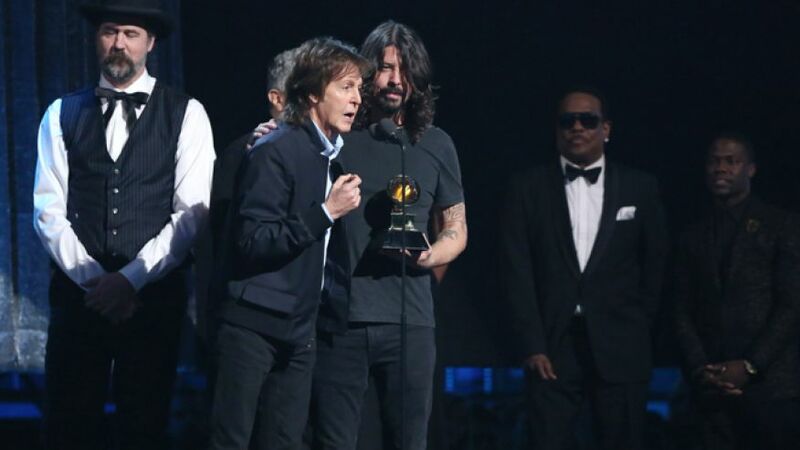 It was quite the way to kick off Invasion 50, with Sir Paul sweeping all five of his Grammy nominated categories, then being joined on stage by his not so daft and certainly NOT a punk, Ringo Starr, on Paul’s “NEW” song “Queenie Eye”, which takes us back to The Boys days as kids growing up in Liverpool playing an innocent game of ball. 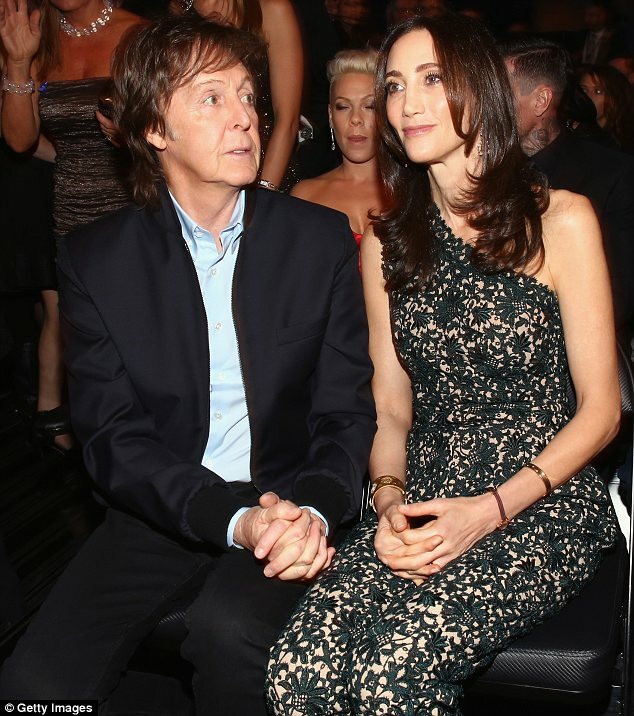 But Beatle fans agree, the Bell of the Ball was Sir Paul, who looked fantastically happy with his sparkling gorgeous wife, Nancy. 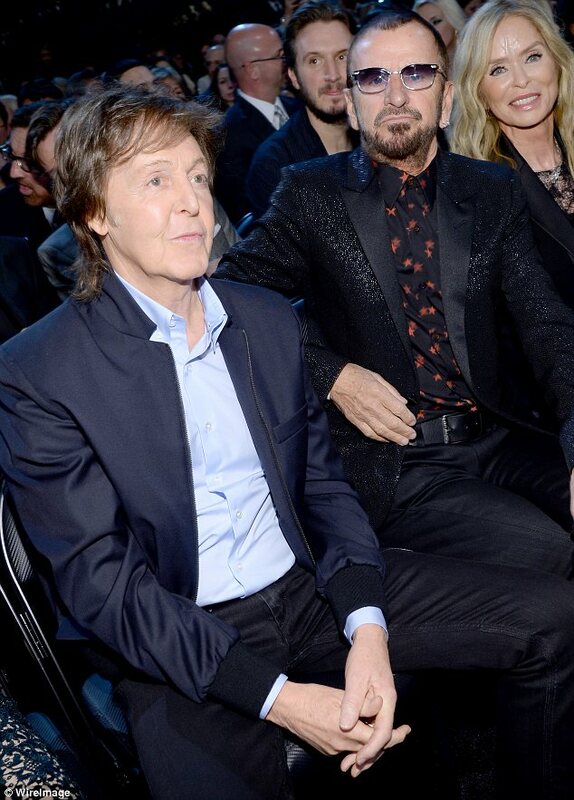 In the audience, Paul and Ringo rubbed knees at their seats, as some of rock’s royalty rubbed elbows on stage and backstage. 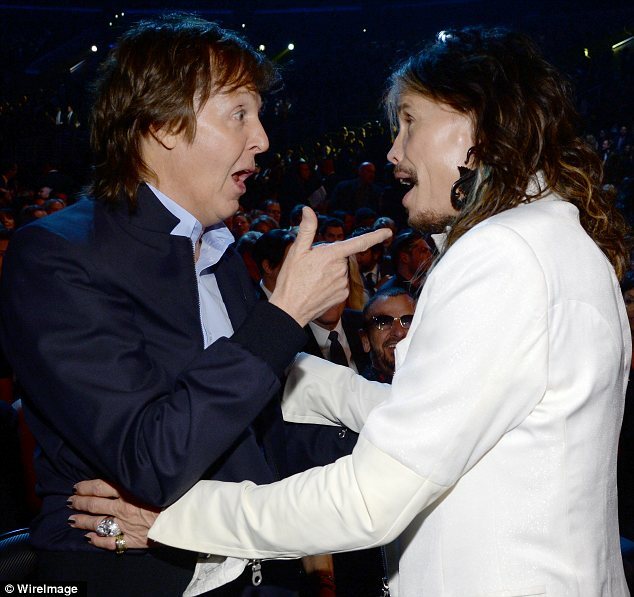 Including Paul with Katy Perry and Steven Tyler. 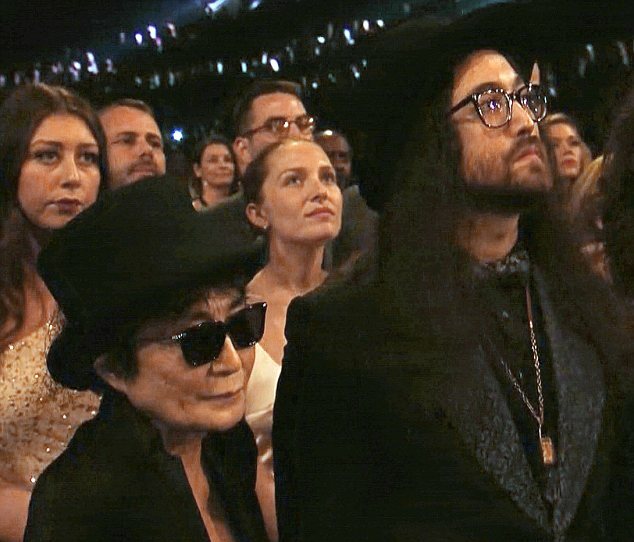 Yoko brought her up to date Walrus, Sean, who looked hauntingly like a 1969 version of his father. Ringo, introduced by the hardly-coherent Ozzy Osbourne standing with his Black Sabbath band mates, later admitted that he completely F*d up the intro. He could use a full time interpreter (“Sharon!”). 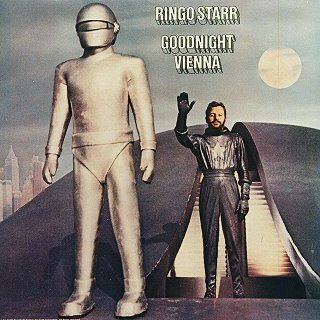 Meanwhile, Ringo took the stage and sang his signature solo song “Photograph”, complete with renderings from his recent publication of the same name. A nice night for music and Beatle fans, who are REALLY looking forward to all of the 50th Anniversary celebrations coming up, most importantly, the one that will air at the exact time as the original Ed Sullivan Show did back in 1964, 8:00 PM February 9th on CBS television with live cut ins from The Ed Sullivan Theater, today home of The Late Show With David Letterman. The main part of the tribute is being recorded today in L.A. (1/27). Well, love and kisses from Beatle Brunch. Listen as we begin our countdown to Invasion 50, and join us in South Florida for two amazing Beatle tributes: Saturday and Sunday Feb 15-16th at The Deauville Hotel, Miami Beach as http://www.1964thetribute.com plays the same stage The Beatles did 50 years ago to the weekend. Get tickets at https://tickets.completeticketsolutions.com/1964/Online/default.asp then join me as host of the most note-perfect Beatle Band, http://www.thefabfaux.com who will play a special concert featuring all of The Beatles television music, including their Ed Sullivan performances, Shindig and the Our World satellite telecast. Get tickets for this MUST SEE concert at http://www.parkerplayhouse.com. Thousands of Beatle Fans listen to Beatle Brunch every week on The Westwood One Radio Network. Join The Beatle Brunch Club at http://www.brunchradio.com so you can hear every week’s Beatle Brunch program on demand, plus Old Brown Shows, Beatle Brunch programs from “20 Years Ago Today” and beyond, and remember to follow Beatle Brunch on Twitter and friend us on Facebook.